My grandmother Patsy Sequeira (making one of her funny faces) and grandfather Cyril Pinto, and me (in a funny hat thing), at my Baptism. After my grandmother Patsy Sequeira-Pinto passed away a few years ago, I wrote the short story below about the wonderful memories I have of her. It was published in the US journal The Wilderness House Literary Review in 2014. Enjoy! They say that my language, like my grandmother, is dying. I am sitting next to Nanna on the polyester-covered sofa in her flat. On my forehead is a piece of paper the size of a postage stamp. It’s been slapped on with spittle. My grandmother believes this will make the hiccups go away. Her voice is playful and smiling. There is sun in it. The little finger man passes the crook of my inner elbow then clambers on to where my arm sprouts from my torso. As he jumps to his final destination, a flurry of tickling begins. I squeal and squeal. Nanna laughs and draws me to her in an enveloping hug. She smells of olive oil – it makes her hair shine – and Lux soap and talcum powder. She smacks an exaggerated kiss on the top of my helmet of bowl-cut hair. She doesn’t let on that my hiccups are gone. I shake my head so that my hair flaps in my face. Then I grin. “Ah, I know… you waaant… chocolate rice toast! Right?” Nanna tweaks my nose and I yelp. Thickly buttered slices of pillowy white bread from the neighbourhood bakery, lavishly sprinkled with chocolate rice — a confection otherwise reserved only for baking cookies — is a treat my parents, away at work, never allow. I especially love tracing my finger in the glossy pools of melted butter and chocolate to make spirals and squiggles. Nanna wipes a dribble of melted butter from my chin. “So messy, the way you eat,” she tuts, but her eyes shine at me. They are strange eyes. Their lower lids slant upward in a severe sweep; that might have given her a cold, supercilious look, but instead, because of the playful expression on her mouth, they look mischievous, impish. As I swing my legs and chomp into buttery-chocolate deliciousness, she ruffles my hair. I smile up at her, my cheeks full, my mouth still dribbly, secure in the knowledge of our shared secret. In her eyes now, three decades later, there is no gleam of conspiratorial joy. “Nanna, I love you,” I whisper. I can’t think of anything else to say. Nanna makes no response. She can’t. There is a tube snaking into her strong, straight-bridged nose, delivering liquid nutrients from a can directly to her stomach three times a day. Her stroke six months earlier left the muscles around her mouth and throat semi-paralysed. In the region of my upper left chest, I locate a now familiar dull ache. I clasp her spindly hand and marvel that her face has weathered 86 years but hardly shows the signs. Where is the crêpey lattice cob webbing an elderly neck? The skin at her throat looks merely like well-handled paper, soft and pliable with use. As I kiss the top of her head, I inhale the scent of Johnson’s baby powder. What can I do for her? The same question, nagging me for six months circles back. It would be glorious if she could smile. If she had a reason to. But I’ve never been a prattler. And my usual sardonic observations of life are hardly what she needs to lift her spirits as she confronts the tunnel’s mouth of her mortality. The words escape almost before I can think them solid. ‘Have you eaten’? A ridiculous question, given the food tube delivery system, but the question — a traditional Southeast Asian politeness — bubbled up; I’m speaking Kristang, on instinct. I feel idiotic hearing the words tumble from me like bandy-legged children — ugly and deformed. Where is the rhythmic lilt I vaguely recall from her conversations with her sisters – now all gone – over thirty years ago, when I’m the quiet grandchild sitting beside her at sessions of cherki jepun? To me, Kristang was a sepia-tinted relic from an exotic past. But to my grandmother, the language was alive and beating. It was the bond with her Eurasian mother and nine siblings growing up in a black and white bungalow perched on MacRitchie Hill. It was a deliciously whispered language behind closed doors, out of fear of being heard by their Portuguese-Goan father. The stern, luxuriously moustachioed man banned Kristang at home. His children would master English, the tongue of the British and the route to power and security in Singapore in the 1920s. So my grandmother’s Kristang had been the language of childhood laughter and joking repartee, the heart’s tongue of family intimacy. It was the linguistic mould that had shaped and cradled her thoughts. Nanna doesn’t seem to think I sound idiotic. Or perhaps she does. The right corner of her mouth twitches for a fraction of a second and I can’t interpret exactly what that means. The ceiling fan blades try to keep the indolent 3pm heat at bay. Heat fans up my throat and cheeks as I glance out of the bedroom door. The chatter of my uncles and aunts floats toward me. One of them is regaling the others with tales of her 17-year-old. Yo – jah kumi. Yo kumi… a-rus. I stand there, feeling a disproportionate sense of achievement having strung together this meagre utterance. I have just told her that I have eaten. I have eaten rice. With those two sentences, I’d exhausted my entire store of Kristang vocabulary. It feels like I’ve just knelt to present my grandmother with a gift of… a rubber band. The whirr of the fan is the only sound softening the silence. Then, after a few still seconds, Nanna squeezes my hand. Could it possibly be that she wanted me to continue? Then, as the plop of a pebble ripples the glassy film of a pool, I realise what I can do for her. The next day when I return with some material, a nervous energy prickles my neck and the soles of my feet. I feel like a stand-up comic about to debut in the spotlight. My grandmother’s sparsely-lashed eyes — once lustrously fringed — shutter slowly, deliberately, as if assuring me that yes, she remembers. A flash of who and all she is overcomes me. “Nanna, I’m going to get something from the kitchen. I’ll come back soon, okay?” I pelt out of the room. I prop my elbows on the ledge of the kitchen window and stare out, unseeing, at lollipoped frangipani trees and people walking dogs. I cram clenched fists against my mouth and am glad for the pain of fingernails digging into my flesh. I exhale deeply and blot my cheeks with a crumpled tissue from my jeans’ pocket. I’ve always considered myself weak. Lacking the stoicism that one admires about people in novels or in war stories who do heroic things with supreme calm. As I stand there, it occurs to me that this is the most difficult thing I have yet to do. But as I walk back to the room, dry-cheeked, my head back, I seem less pathetic to myself, almost strong. That night, in my own flat, I kneel by the rattan box in the corner of the storeroom. A veil of dust covers the pile of books within. I toss aside novels half-read then abandoned. Is it in here? Discarded romances surface as well as hard covers on car engines. I fling them aside, raising mushroom clouds of dust. My nose and eyes are itching as I lift out Bacon, Chocolate and Cheese: The Too Good to be True Diet. As I sit back on my heels and sniffle, I spot it. Buried under a floppy handbook on flash photography is The Kristang Dictionary. I lift it out. Alfonso d’Alburquerque, the hawkish, hook-nosed naval general who commanded the Portuguese fleet in 1511, soon found that Malacca was teeming with other peoples – Chinese, Arabs, Indonesians, Indians – also keen to profit from the lucrative spice trade between Southeast Asia and Europe. He promptly summoned reinforcements from home. The King of Portugal, instead of sending more warships, dispatched ordinary Portuguese men and women to populate the town, choosing the path of peaceful, though insidious propagation and assimilation within the local community rather than violent intimidation. The new Portuguese immigrants married the local Chinese, Malays and Indians. The Portuguese tongue, planted in rich Malaccan soil, took into itself the complex wealth of its environment, absorbing words from the Straits Chinese (chap chye – a mixed vegetable dish), the Malays (brani – brave, daring, chinchaloh – fermented shrimp relish) and the Indonesians (jimat – a careful spender), to blossom into a Malayanised European linguistic rose most exotic, unique in all of Asia and Europe. I flip to the dictionary proper and find myself at ‘K’ – kara – face, kara feu – ugly. Suddenly I’m back at one of my grandmother’s cherki afternoons where I sit unheard, unseen. The resident gossip is gabbling about how pretty her grandson’s new fiancée is. A grand aunt with tightly scraped back hair bends her head toward my grandmother and mutters, “Kara feu!” and the frickative “f” is blown with a full force of scorn. Nanna flaps open her cotton and lace fan and covers her mouth. Grammatical Structure; Music and Song; Festivals and Cuisine. For the predominantly Catholic Portuguese-Eurasians, festive occasions are the major events on the religious calendar, times for boisterous family gatherings centred around food. Indeed. Two weeks before Christmas, Nanna would be rolling out short crust pastry on the dining room table using the same wooden rolling pin she’d been using since she got married at 18. The pastry would form the shell of pineapple jam tarts. She’d press out the scallop-edged discs with a brass and wooden mould. In a monster of a cauldron was pineapple jam — it was probably full from the fifteen pineapples that had been hand-grated and slow-cooked over a gentle fire every day for a week, inviting the alchemy of pulpy yellow froth into a sticky mass of burnished gold. The air would be a syrupy mist of cinnamon and clove-perfumed vapours that clung to our hair and clothes. Already prepared — a month before and standing sentinel on the kitchen shelves — were the rows of achar jars. A fiery medley of green mango preserves – dried in the sun, salted, vinegared and spiced – and the milder vegetable pickle of cucumber, carrot and cauliflower. And on the highest shelves sat the brandy-drenched fruitcakes and plum puddings, made in October, maturing with dignified grace. The following week, the smells of baking pastry and caramelised pineapple would be replaced with the almond-vanilla wafts of sugee cake. “You really want to put that in the oven?” Nanna would say, questioning the results of her letting me entertain myself with bits of dough or concoctions of cake batter. The pale yellow dough of the pineapple tart I’d been working on all afternoon had taken on a dubious grey tinge. The mountain of pineapple jam I’d fashioned in the pastry case was three times the height of Nanna’s smooth domes. And, I’d also tried to sculpt a pair of mouse ears at the very peak. I nodded. Nanna frowned and put it in the oven anyway. Somehow though, I’d could never find my creations in the vast terrain of pastries left to cool on parchment later. There is a recipe for pineapple tarts and sugee cake in the book. There are nursery rhymes, like Gatu Bai, Gatu Beng, and prayers. I clasp the book to my chest. I sit back on my heels, and feel sparklers going off inside me, very slowly. I’m sitting down to my breakfast of muesli the next morning, running through the freshly memorised words now in my head — tar di nanas, farinya, asah kukis — when the phone rings. It is my aunt, her voice wet. The receiver tumbles from my hand, its curlicued cord snaking over the edge of the table and dangling just above the floor, winding and unwinding in a silently creaking pirouette. The scores of words and phrases are left ungifted. I’d imagined presenting them in careful rations — one or two each day — to stretch out the joy over the next few months. At the very least, a few months. Now, they would remain unspoken, unheard, gifts without a receiver, floating between this world and the next and belonging nowhere. I’m about to sit down to dinner at the kitchen table in my flat. Beside the plate of rocket and rice curry salad, taped to the table, is a piece of white card with the word basiu scrawled on it in black marker. Another piece of card is taped to the table next to the glass of water and says glas (agu). My spoon and fork have labels cellotaped to them so the ink won’t run when they’re washed marked — they’re kuleh and garfu respectively. All over my kitchen and throughout my tiny apartment, on appliances, flowerpots, chairs, shelves are white labels. The one on the wooden model of a Portuguese warship on the coffee table in the living room says caravel. The vessel faces the South China Sea. My hours of research these past months tell me that this was the direction our sea-faring ancestors came from to set up a trading base in Malacca. At the height of its use in the seventeenth century, not only was Kristang adopted by the Dutch colonials who came after the Portuguese, but every Malaccan spoke it — from the Hokkien merchants bargaining for fish from Portuguese trawlers to the Tamil and Cantonese children playing hopscotch with their friends in the suburbs. I found it astounding that the language – ours – had been spoken by all those people in all their variety, so long ago. I had also been experimenting. Mention the word Kristang in Singapore today, and you draw blank stares. Even its name sounds as obscure as geographical points in ancient Roman Iberia: Lucentum, Azalia, Kristang…. Today, in Malaysia and Singapore, it’s one of Southeast Asia’s vanishing linguistic jewels; only roughly five thousand people speak it. And we’d never thought to record it. Perhaps we’d assumed it would always be with us. But the knot of surviving speakers grows smaller every year as white heads droop and wrinkled lids close for the last time. And with them a lifetime and inheritance of customs and laughter, repartee and colour leaches into the dust of unmemory. Their middle-aged children know only a smattering of phrases. They’d embrace English during the 1950s and 1960s; the lingua of American and British pop culture. It had cachet. It was the language of Elvis, The Beatles and Bob Dylan. And they would later tell their own children, who asked what their mother tongue was, that English was the mother tongue of Eurasians. Alas. In an absent reply over the evening news or a television game show, over five centuries of cultural legacy was shrugged off into oblivion. But today, I have found some more strength from it. bestow them. The gift of knowing and being who they are, and who and all they have been. And we will form a single, unbroken thread, stretching from my youngest grandchild in a future Southeast Asia, winding backward to the admiral, apothecary or merchant at the root of our heritage, perhaps five hundred, a thousand or even more years ago in that maritime European nation across many seas. And our language will course through the line, fresh, life-giving blood linking us in a perfect circlet to cradle our common love of easy laughter and the simple joys of existence. We are, all of us, and Nanna, inextricably bound unto eternity. I lift a forkful of salad leaves and rice to my mouth. I recite to myself as I begin chewing. Terrific article ! Brought a flood of memories of my youth, mother and grandmother. That piece of paper stuck to the forehead to cure hiccups is an absolute gem. Kristang has slipped into the cracks of time and almost forgotten.Keep your articles coming. Our youth needs to be reminded of their colourful history. Articles like yours are priceless ! And also incensing the house after evening rosary. Is it still practiced? I wonder. We did that in my home too, incensing after the rosary, but not every day. Thanks Richard!! I’ve been wanting to find a group of people interested in speaking/learning Kristang in Singapore! Thank you for sharing your memories and photos..my mother, who is in her 80s and now living in Canadavwas thrilled to see the photos of her favourite cousin Cyril and his wife Patsy..I never met Cyril but I still remember his mother, Auntie Nellie. 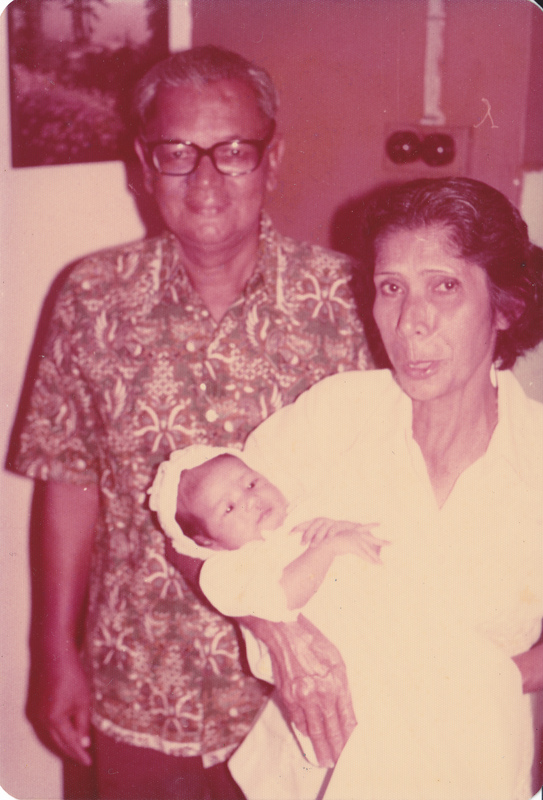 Aunty Nelli and my grandmother, Jane Pinto were sisters. I was able to spend an hour this morning reading The Gift again while I noted down my favourite phrases and sentences from it. Unfortunately, the list is finally too long to reproduce here 🙂 For the sake of brevity, I’ll mention just one (where the narrator drops the phone): ”…its curlicued cord snaking over the edge of the table and dangling just above the floor, winding and unwinding in a silently creaking pirouette.” So perfectly imaged! And how this moment ties up aptly and directly and lucidly the abruptly broken communication, permanently hanging between her and her grandmother now…–Well, the simplicity and the immediacy of the scene moves me very much. The sun and light imagery throughout was affecting too. Examples including ”I say, forcing sun into my voice” and ”I sit back…and feel sparklers going off inside me, very slowly.” Amazing, I can feel the piercing warmth and the gleaming fission inside! And I have to quote this gem: ”My grandmother’s sparsely-lashed eyes – once lustrously fringed – shutter slowly…” Gorgeous. And as whenever you write about food, Melissa, in your stories, the whole descriptive litany comes off pitch-pleasingly-flawless for my money. Warm, domestic, magical (”the alchemy of pulpy yellow froth into a sticky mass of burnished gold”). I love the white-labelled ”snowfall’ of Kristang around the apartment visually and emotionally. There is a calm and an urgency combined I feel in your prose, in the way your stories are written and composed. A kind of silence and a kind of intensity infused in the way the words, the images and the emotions weave and spiral somehow. The author’s presence is definite and strong; her opinions and position on things clearly there; but yet the greater life and spontaneous character of the world brought into being in these pages come through with clarity, effortlessly; they even beam. The Gift, for me, shone with real poignancy – its gentle humour entertained, its nostalgia pinched, its innocence reminded and its unhurriedness assured. I felt taken along by the hand of this author to the rooms where I saw the emotional sum of a granddaughter’s love as if by magic put down lightly, in moments then gone, in words somehow just right enough to say it for us true. Thank you, Melissa. You have the gift. Dear Brian, the attention and time you have spent reading and appreciating my story astounds and humbles me, as do your beautiful insights. It is a privilege to be read by you, appreciated by you. YOU are a gift to me!